I want to thank Houghton Mifflin Children's Books for sending me a copy of this book to read and give an honest review. I had received a copy on Net Galley but was unable to read it and the publisher was nice enough to send me a hard copy! Receiving this book for free has in no way influenced my opinion or review. 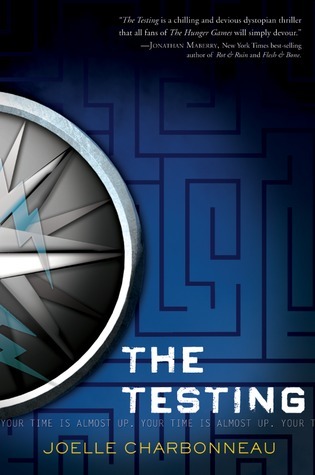 So, who wouldn't want to try a book that is billed as the next Hunger Games? I loved The Hunger Games, so I jumped at the chance to give this one a try. Even read the blurb of this one, which I usually don't do, to see what it was all about. I have to say the concept really intrigued me for sure. I was really excited to finally get into another dystopian, as I haven't read one that has truly pulled me in since The Hunger Games. The cover of this book is very simple. Once you read it, you understand what is pictured. I understand the want to go with something simple, but I feel like there could have been a bit more to it. It suits the book fairly well but I really would have liked more. I will tell you now that if you are looking for a book that very much mimics The Hunger Games, this is it. It is eerily similar to a fault, to be honest. The characters names are different, but the concept of children fighting for survival and being pitted against each other rings throughout the book. I was actually a bit disappointed in the fact that there really wasn't much of a difference and truly wonder if the author has gotten her ideas straight from those books.There is even a scene where the main character climbs into a tree to sleep; certainly I pictured Katniss in my mind (from both the book and movie) when this scene occurred! Malencia Vale (Cia) is an interesting enough character. She's fairly strong and definitely resilient. And she shows the smarts that are needed to be part of the testing. But unlike Katniss she wants to be chosen for the testing believing the testing will help her advance to university where she will learn to heal her broken world. Of course the corrupt government has other ideas, though we are never told their true reasoning behind the testing. We do know they want to find the most fit candidates to attend the University and help heal the destruction that has occurred due to the past wars. But the underlying tone, which Cia quickly picks up on, is that there is more to it then they are telling her. She, however, doesn't try to figure out what it is. I do understand that her will is more to survive so she can cross the finish line, but it just doesn't seem like she even cares to try and figure out what lies beneath the government's plan. Tomas Endress, well, he seems like he's hiding something from the beginning. I just didn't trust him. And, while he and Cia have some sort of history having grown up together, their attraction seems kind of forced and doesn't evolve as I would like. The relationship also seems almost out of place in the landscape Charbonneau paints. I can't picture what Tomas looks like in my mind, which drives me bonkers. I know he has a dimple, but that is all I can honestly remember after having read the entire book with him in most of the scenes! He isn't someone I would remember in the future, nothing about him stands out and makes me want to remember him, either. As for the supporting characters, they seem to just be there. Again, I feel no connection with any of them. I don't feel any emotion for them at all. And I have no idea what any of them truly looks like. I would have also liked to see more about the relationship between Cia and her brothers. I thought for sure, after reading the prequel, that we would get a bit more about Zeen (her oldest brother) and why it is that he and Cia are so close. But I don't really get anything at all about their relationship. And he actually disappears during what I would have thought would be the most important time for Charbonneau to have him in the book. I can tell that Cia has a good repore with her father. He trusts her and reveals secrets to her he feels she is sure to keep. This is the only relationship in the book that truly struck my interest. So, as you can tell, I wan't completely thrilled with the cast of this book. I will tell you why I could not connect with them: this book is almost all narration from the main character's point of view. I understand the need to build a world, but Charbonneau has long paragraphs of narrative that completely take me out of the story. There is barely any dialogue between characters. This caused my inability to understand their relationships with one another. Everything I learn about them is from Cia's POV. I really would have liked to see them through dialogue and interaction. But it just was not there. When dialogue does appear, for the most part it is short and quipped, which would not be so bad except it would maybe consist of three or four lines before once again going back into long narratives from the MC's POV. Another point of contention was the speeches that were made by the governmental officials They were LONG. It totally took me out of the story. I actually had a very hard time finishing some of them and would often have to back track to understand what the character was talking about. It was very distracting. Remember the kids in The Hunger Games traveled by trains to Capital City? Well in The Testing it is a smaller group of kids traveling in some kind of hover craft type vehicle on their way to the capital city. Again, the similarity is still there. As if there is a cookie cutter outline and Charbonneau has taken it and added her ideas. And I'm not feeling the total dystopian landscape that really needs to exist to understand how the people might be suffering. The children get schooling, everyone seems to be well fed, they are not dirty, they live well enough and people seem to have jobs. I just don't get how the destruction has decimated these people's lives. So, these kids are thrown into a race to a finish line, meeting up with each other along the way, and often getting into violent confrontations. Yup, certainly reminded me of The Hunger Games. However, in The Hunger Games, the characters had reason to be violent and even kill one another. The Testing officials tell the candidates whoever makes it back will be interviewed for their final admission to university. They really don't give the candidates much of a reason to be killing each other. Sure, by offing their competition there are less of them to finish thus decreasing the risk of not being chosen for university. However, I just didn't feel like there was enough reason for them to be picking each other off. Finally, and I cannot say this enough, there are barely any specifics given in this story. It just kind of chugs along as the kids move through the barren dystopian landscape and try to survive. Since there are no real relationships formed, we hardly get an idea of their fear or any other emotion they might have as they experience this harsh landscape and watch the other candidates go down. And since we have no real idea of why the wars happened, other than the people having not been intelligent enough, it's hard to understand what they are even racing towards. In conclusion this book is full of plot holes, poor character development, and no explanations of why things are the way they are. The story line is weak and so closely resembles THG, I could not help but picture those characters as I read along. And I did not want that. I wanted something new and different. Something that would grab me and drag me, have me wanting more. Something that I would not be able to put down. This was not that book. Will fans of THG like this series, perhaps. If they can put aside the fact that it is pretty much a carbon copy of what they already know. Otherwise, I say skip it and just wait for Catching Fire to come out in the theaters so you can happily continue to follow those characters as you did with the books. It's a shame, really, because the story line does have some potential.